If you’re a kid and you love animals, then this post is for you! And really anyone who loves animals, including animals! (although i don't know if they have Internet.) I’m so excited to be making my second video just for you! If you missed the first video, we talked all about milk. You can watch that later if you want! Today we’re going to talk about meat. And in case you missed my first video, I’ll say again that I won’t be showing you anything scary, that I promise to not talk down to you (cause you’re pretty smart) and I promise tell you the truth no matter what. Now, if you’re like me, you love animals. Well, today we’re going to talk about why eating meat doesn’t really make sense if you love animals and some other reasons people called “vegans” and “vegetarians” don’t eat it. It may sound silly but it’s important to realize that bacon, beef, ham, pork, mutton, lamb chops, fish sticks and chicken nuggets are all made from animals. Meat is pieces of these animals muscles and to get these pieces we have to kill the animals. Some adults may even tell you that the animals don’t feel anything when they die or that they were put here for us to eat. But I like to put in the animals’ shoes, or hooves, claws or what have you, and think about how I would want to be treated. Now this is pretty sad but really important: We kill animals for food when they are still kids and they don’t get to run and jump and play like you do and like every kid should. They are cramped into tiny cages and taken away from their families. Imagine how scary and sad that would be! I don’t know about you but I don’t think that sounds like it’s pain-free or anything that someone who loves animals should be doing to them. Meat does a lot of things to our body and most of them aren’t very good. In my country, the United States, we eat a lot of meat and have a lot of diseases that countries without high meat consumption don’t. Now there’s a lot of science and doctor speak I could get into but it’s kind of boring, to tell you the truth. If you want to learn more about it all you can look at some of the links I added down below. Anyways, let’s try to make it real simple. 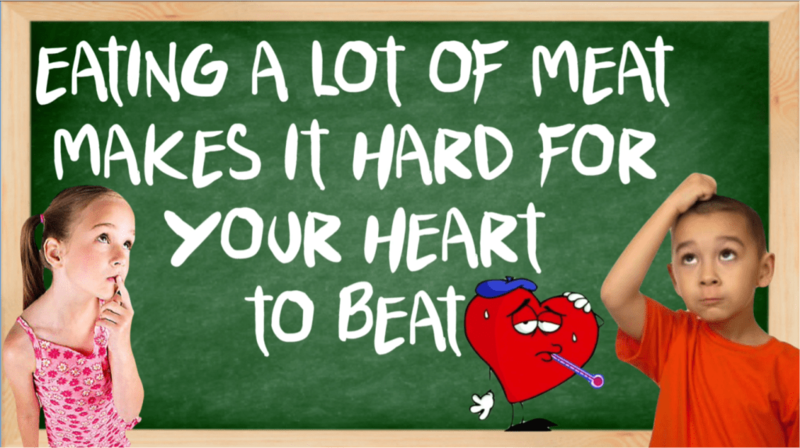 Eating a lot of meat can make it hard for your heart to do its job, which is a really important one! It can also contribute to cancer and diabetes. The environment is very important and it’s in danger. For you to have an earth to live on, we have to start changing things otherwise the earth could face some serious problems within your lifetime. You may hear adults talk about recycling or saving water, but eating animals is the absolute worst thing we can do for the environment. It takes so much water and other resources to raise and house all the animals we eat. Can you imaging not showering for 79 years? you’d be pretty stinky! So I think it’s best for everyone to just not eat animals! If you want to learn more about what eating animals does to the environment, you can see this video post here. So you may have heard that there are a lot of people in this world who don’t have enough to eat. Sometimes adults use this argument to get you to eat your food, which I never quite got. My solution was to give them my food! Well, something you may not know is that of all the food we grow like corn and soy and the like, around the world as much as 60-80 percent is fed to the animals we raise to eat. So we already have all the food we need to feed everyone in the world! But because we eat animals, there’s not enough to go around. I hope that this was helpful. 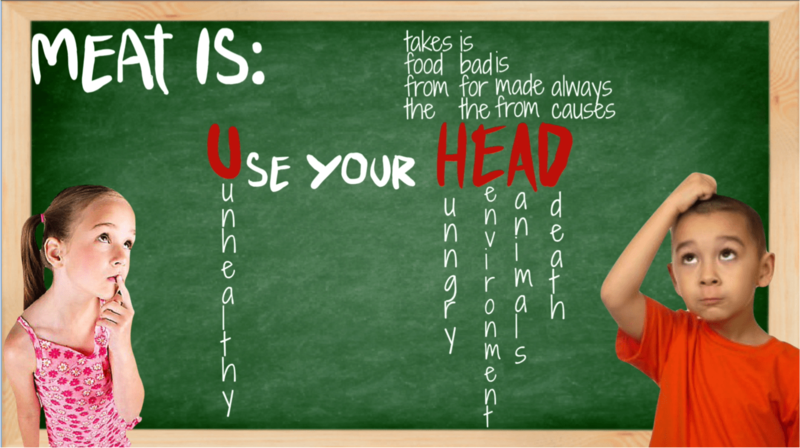 just remember, when it come to meat, Use your HEAD: meat is Unhealthy, takes food from the Hungry, is bad for the Environment, comes from Animals’ bodies, and always causes Death. Thank you for reading this, even the hard parts. Now you know why not to eat meat. Let me know what you thought of the video in the comments and if you have other things you’d like me to cover, let me know! Here's Some “Meat” You CAN Eat! Very nicely done. It is education for children and done without scaring them or upsetting them. The future of veganism is the young generation learning about where their meat comes from. I wish this information was around when I was a kid and someone like you spoke to children about meat eating. Wow thank you so much! I wish it was for me too, honestly, which is a big motivation for making these. So glad it came across well! The most challenging part of raising vegan kids is answering all of their questions and arming them with knowledge to make their own decisions even when I’m not there. The truth is hard to see and listen to sometimes because it is so brutal (thus, the truth isn’t always easy), and I’m constantly looking for resources for vegan parents of small children, to pass on their values in a way that isn’t preachy (because it’s nice to do things because you choose to not because an adult is forcing you to) and that makes sense in very young minds. And then as parents we also want our kids to plant their own seeds of wisdom in the face of adversity, and the only way they can do that is if they have the right information that is straightforward and noncomplex. Thank you for helping me as a parent! Thank you. I’m really enjoying this series and I believe it will be a great help for my daughter (4 years) as she starts to enter into discussions with others who will try and convince her she is wrong. A suggestion for a follow up video in the kids series – I’d love to see one on nutrition for kids covering the topics things that people tell them they aren’t getting enough of (B12, calcium, protien etc etc). Very clear and thorough message. I can’t wait for my niece to be old enough to see these. What a great little video for kids. I have raised both my children vegan so things like this is a great little reminder on why we live a vegan lifestyle. Thanks for all your efforts.